… to the Bloomsbury; Cheltenham & Bloomsbury; and UCL Aikido Clubs’ website. Our Prime Aims: To provide opportunity to practise Aikido in an atmosphere of friendship, encouragement and mutual development, following the example set by Aikido Founder, O Sensei M. Ueshiba, his heirs (Doshus) and one of our most respected British teachers, Shihan Mr W.Smith M.B.E. C&B Aikido Weekday Daytime Training: New Year 2019. Classes resume Mon 14 Jan’19. 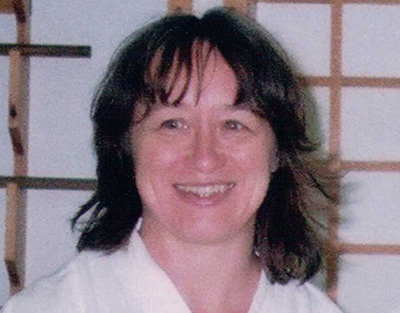 Barbara Sotowicz Sensei, 5th Dan, Goshinkai Shidoin, BAB L3 Coach. 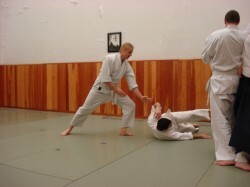 BAC: A UCL Alumni Aikido Group club. 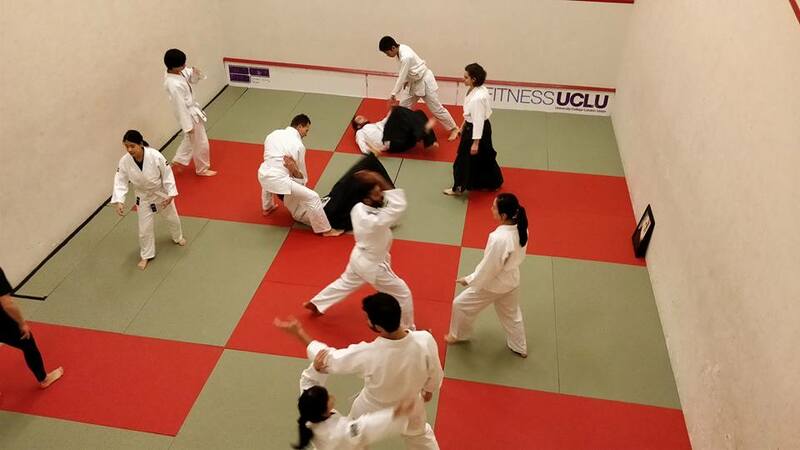 An alumni counterpart, in London, to the UCL Aikido Club. BAC is a founder member of Goshinkai (f. June 2016). BAC hosts UCLAAG and GSK courses in London. Read BACNewsletter 2017-1. Cheltenham & Bloomsbury Aikido Club (f. 23/1/2018). Leisure@Cheltenham sports hall. Q1 2019 timetable go to ‘News’; usually Mondays 11:15-12:15. 1st & 3rd Fridays of month 12:15-13:15. Class fee £7 standard, £5 concession, Beginner first trial class free; membership fee go to ‘Joining’. Membership of C&BAC is open to adults (18+years). Visitors from other clubs/associations and beginners always welcome. Contact C&BAC. 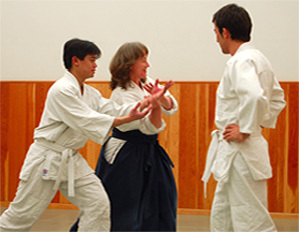 Student-led club offering traditional Aikikai Aikido. Teaching by UCL Alumni Aikido Group & Friends Instructors: Senseis Andy Washbrook 2 Dan; Ara Schorscher-Petcu 2 Dan; Alex Taylor-Ash, 2 Dan. Training is in the MP Room, Bloomsbury Fitness. Please come early to lay mats (the traditional dojo at UCL was undemocratically demolished on 14/12/2013). Contact UCL Aikido President. Join UCL Aikido fee. Non-UCL Student Join UCL Club fee. C&BAC is a member of the GoShinKai Association, a member of the British Aikido Board (UK governing body for Aikido). This is a combined fee for membership to GSK, C&BAC and BAB. It covers insurance to practise Aikido in the UK. Standard: £37; Concessions £30. of which £5 is C&BAC membership. Before your first class, for Health and Safety reasons please complete the Goshinkai Member/Visitor Form and the Bloomsbury Aikido Club PARQ. For insurance reasons, new beginners’ club membership fees are payable before the fourth class. Members must renew their annual memberships prior to the expiry of their insurance. Visitors from other UK associations must show insurance slips. Visitors from abroad must bring evidence of travel insurance covering martial arts activities. Training clothes: a Judo or Karate suit. At first, a sturdy T-shirt and track suit trousers will do, protecting shoulders and knees and allowing you to move freely. For safety, jewellery etc. should be taken off. Training, when on mats, is in bare feet; shoes worn to and from the mat. Bloomsbury Fitness Centre 15 Gordon Street, London WC1. Leisure at Cheltenham Tommy Taylors Lane, Cheltenham GL50 4RN. 9 Mar’19: Sensei B.Sotowicz at UCL Aikido Club. Kyu Gradings. 16-17 Mar’19 GoShinKai Spring Course and Dan gradings at Kidderminster Renseikan Dojo. Date tbc: Sensei Mike Smith at UCL Aikido Club. Date tbc: UCL Alumni Aikido & Friends Group Reunion 2019. GoShinKai Courses GSK event calendar 2019 for GSK National, Teachers’ and Twice-monthly Weapons Courses. N.B. published dates may be subject to change. Bloomsbury Aikido Logo: A big THANK YOU to Jon Maunder for creating and donating our logo.